Seth Kantner's "Ordinary Wolves" told the story of a white boy raised in a sod igloo on the Arctic tundra. A heartbreaking vision of a vanishing world, it established Kantner as one of the nation's most original and authentic writers. Here, he returns to the setting of his debut novel with an autobiographical account of his own life in a rapidly changing land. Beginning with his parents migration to the Alaskan wilderness in the 1950s and extending to his own attempts to balance hunting with writing, Kantner recalls cold nights wrapped in caribou hides, fur-clad visitors arriving on dog sleds, swimming amidst ice floes for wounded waterfowl, and his longstanding respect for the old Inupiaq ways. Captured in words and images, these details combine to reveal a singular landscape at a pivotal moment in its history. Both an elegy and a romp, the book illuminates a world few will see as Kantner has. 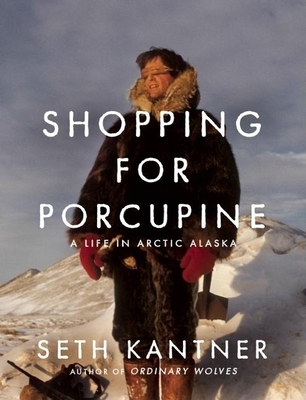 For all the popularity of the recent bestseller and hit movies about Alaska, Shopping for Porcupine comes from a place you haven’t seen and can hardly imagine.